You Are Not Dead: the Revenge! 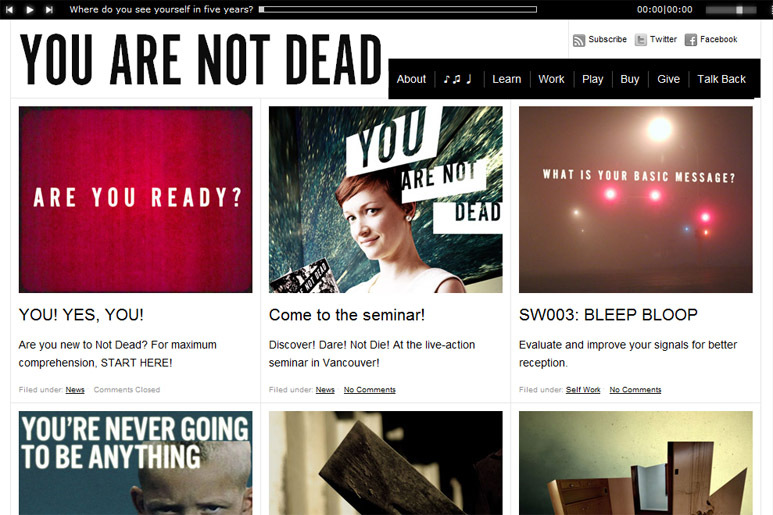 You Are Not Dead .com !!! This new site is a full-throttle reimagining of the sterling, satirical self-management program, first released in 2008 by the Fakeproject Corporation of America (musician and artist Daniel Reetz and myself). The updated text incorporates some of the revisions introduced with the 2010 Canadian Edition, as well as showcases new images, Self Work and more. Why now? If you hadn’t heard, the live-action seminar is being remounted by Black Pants in Vancouver, BC, at the Fringe Festival this week. Check it out! Em O’Neill and I attended the seminar last week, and we were absolutely blown away. The play is incredible, and Black Pants definitely did it justice. Nice work! Oh, wonderful! That’s awesome to hear. So glad you liked it!